The CAC’s recent revision of its extensive coverage of the C6 Z06’s LS7 engine included a how-to article on how to measure the valve-stem-to-guide clearance on an engine installed in a vehicle. For that how-to article we tested a couple of valve sping compressors. The first was a tool made by Lingenfelter Performance Engineering. The second is a spring compressor of a different design is made by LSM Racing Products and sold by Summit Racing. It compresses the intake and exhaust springs simultaneously with force being applied straight down rather than in an arc reducing possibility of the retainer contacting the valve stem. The LMS compressor is the screw type so it takes longer to use but it does two valves at once. Use caution when purchasing spring compressors like this. Some are claimed by their makers to fit LS7s but they do not. We tested Summit's LMS compressor and it, indeed, works on an LS7 and works quite well. The easiest way to obtain the LMS compressor is to buy it from Summit. 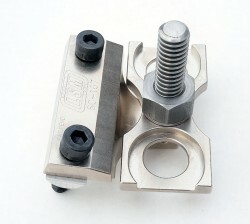 The tool's Summit part number is LSM-SC-167. The LMS tool is a little more time consuming to set-up, but it does both springs on a given cylinder simultaneously. First, set the rocker fulcrum adapter on the rocker arm fulcrums of cylinder in question. Back the big nut in the center out a ways, then, bolt the tool in place using the Allen bolts which come with it–finger tight is good enough. Use a 7/8-ths deep socket to carefully tighten the big nut, compressing the springs until you can use a magnet to grab the four locks. Run the bolt back up until you can remove the springs and retainers. Then, remove the tool. Bottom line: we totally like Summit’s LMS SC-167 Spring Compressor. More info? Visit Summit Racing’s web site.